Based in Christchurch, New Zealand, Heli Maintenance is Canterbury's only CAA Part 145 A4 Approved helicopter maintenance company offering helicopter sales, service and parts. The team at Heli Maintenance are specialists in the provision of quality service on Robinson R22, R44, R66, MD500 series, Schweizer/Hughes 300 series, AS350, EC120, AS341 Gazelle and Bell 206 helicopters. Heli Maintenance is also a NZCAA certified supply organisation providing spares for Robinson R22, R44, R66, MD500 series, Schweizer/Hughes 300 series, AS350, EC120, AS341 Gazelle and Bell 206 helicopters. Please browse the pages of our website to discover the full range of services offered. Heli Maintenance is now a fully approved R66 Service Centre with Dave having completed both the R66 and RR300 maintenance courses.We are also very pleased to have the first R66 on our books. We have had a busy time in the Overhaul Shop over the last few months including carrying out work on MD500 components since they were recently added to our scope. Reminder to all Aircraft operators with Kannad 406 ELT's fitted. We are fully approved to replace your ELT battery and program your ELT. R22 / R44 2200 hr rebuild Kits, 12 year inspections and helicopter refurbishment. Let us provide a quote for your kit and/or rebuild. 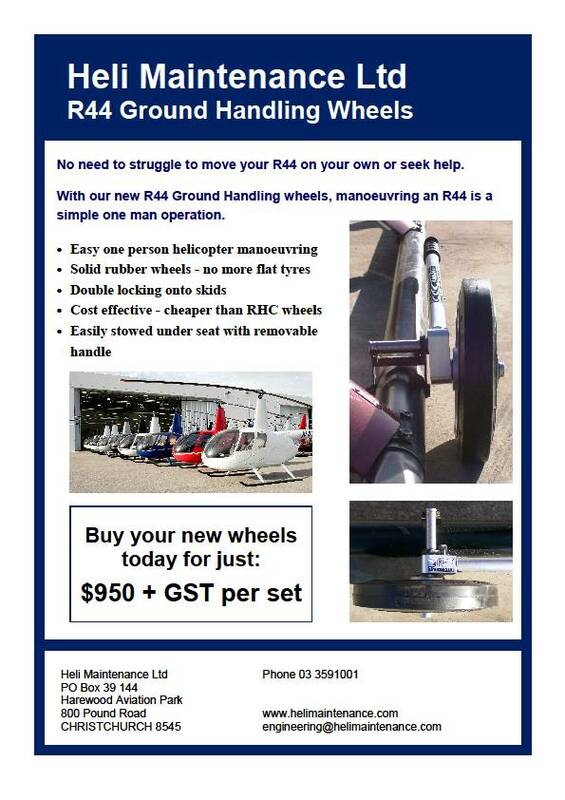 To all R44 owners; if you haven't already seen our new style ground handling wheels, pop in for a demonstration of how easy it is to manoeuvre your aircraft using them. The wheels are quality built and competitively priced against the RHC factory inflatable wheels. We have more exciting modification projects in the pipeline to benefit Robinson helicopter owners. More details to come as they progress. The right to live and work in New Zealand. Please do not apply if you do not meet this criteria.